Free Shipping for qualified orders over $175 - Sales tax on NY orders only! 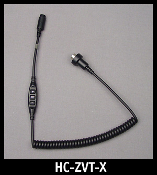 This heavy-duty "HC-ZVT-X" Z-Series 8-pin lower-section hook-up cord, with integrated volume control & PTT button, is to be used with all J&M Elite Series headset #’s HS-ECD629, HS-ICD629, HS-ECD584, HS-ICD584, HS-ECD477, HS- ICD477, HS-ECD374, HS-ECD271 and HS-ECD269 headsets for connection to the passenger-position on 2008-2014 Kawasaki, Can-Am Spyder & Victory 7-pin audio systems. We are Military friendly, and will ship to APO / FPO addresses. We use titles, descriptions and images provided by the manufacturer and distributor. While we attempt to make every effort to ensure the accuracy of this data, occasionally mistakes do occur. We encourage you to check the manufacturer's website for more information by referencing the manufacturer's part number. Please order carefully, Insure that you are ordering the correct product for your application. Check the manufacturer link provided to insure that you are ordering the correct item. If your motorcycle has been modified, only you can determine how that modification will affect your installation. We can't see the modification, hence we are hesitant to make a recommendation for you! Please note that some images are representative and, while similar, may not be of the exact product for your particular application. "Hitt-N-Miss" is a subsidiary of our parent company "Shinhopples". Many countries impose additional taxes, duties, or other charges on imported items. These fees are not included in the item price or shipping cost that we charge. It is the buyer's responsibility to pay these fees. Please check with your country's customs office before buying if this is a concern of yours. By law, it is illegal for us to falsify product price declarations on shipping documents. We are a credible and responsible business. We stand to lose everything if we cheat. Secondly, a lower declaration of price will have a negative effect on the customer, should a claim become necessary. Thank You for not asking ! Delivery times for international orders vary greatly due to shipping and customs processing times. It is not unprecedented for an item to take as long as 6 weeks to arrive in some locations. Please be patient. We will provide shipping details as soon as the item ships. Once an item is in the Delivery Carrier System, there is nothing that we can do to speed up the process. What you see in the tracking information, is exactly what we see. We have no control over Customs or Shipment Delivery Carriers. J&M Headsets, CB, cords, antennas, and accessories. Copyright © 2007-2019 Shinhopples. All rights reserved.